Get 10% off all Massive Headphones with bluetooth enabled. July 4th Deals! 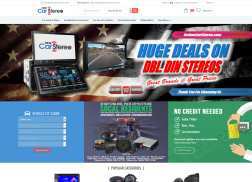 Get 5% Off Car Audio/Video Equipment of $120. Deep discounts on car speakers, amplifiers and subwoofers. Get 3% Off Boss Audio Systems. Get 3% off Pioneer AVH-X4800BS, Massive Audio SUMMO 84, Pioneer TS-A6995S-PKG, Rockford P1000X1BD. Get 7% off All MB Quart Products. Get 5% off Amplifiers, Speakers & Subwoofers. Get 5% Off MBQUART products. Get 3% Off JVC Products. Presidents’ Day Sale! Get Up to 60% Off Hundreds Of Items + Additional 3% off by applying code. Get Instant 10% off all JL Audio, Alpine, Wetsounds, Memphis Audio and MTX car stereos, car amplifiers, car speakers, car subwoofers and various other car audio and car video equipment. Get an additional 3% off during Easter Eggs Travaganza. Get up to 60% off during Easter Eggs Travaganza. Get 10% Off MTX Products. Memorial Day Sale! Get Free VR3-12 subwoofer with orders over $250. Get 5% off JVC products. Get 10% Off JL Audio. Get up to 70% off Car Audio Gears. Get 5% Off Massive Audio. Get 10% Off JL Audio Stealthbox Systems. Limited time offer.